Chelsea are reportedly set to sign Kenneth Omeruo from Standard Liege this month before loaning him out to ADO Den Haag with immediate effect. Earlier this week Den Haag stated that they would sign a player on loan from a Premier League side for the remainder of the 2011-12 season but refused to divulge any name. And now reports in the Dutch media claim that the player in question is Omeruo, who is expected to play for the Eredivisie side until the end of the 2012-13 campaign. Den Haag coach Maurice Steijn told Omroep West: "I hope he can join our squad quickly if all the paperwork is completed." 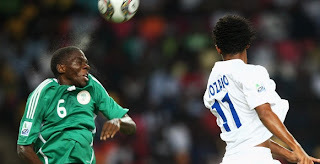 Omeruo, an 18-year-old centre-back, joined Liege last summer and played for the Nigeria Under-20 national team at the U20 World Cup in Colombia.